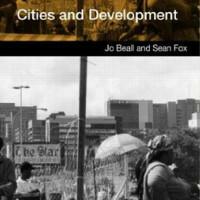 Cities and Development brings into conversation debates from urban and development studies. It grapples with both the challenges and opportunities associated with rapid urban change and provides a critical assessment of current policy and planning responses to the contemporary urban challenge. Jo Beall is Deputy Vice Chancellor at University Cape Town. Sean Fox is a researcher and Teaching Fellow in the Development Studies Institute at the London School of Economics.